Spider Plateau Venting is characterized by vents that surround the voice coil between the motor structure and the spider, the area of the woofer that gets the hottest. Air is directed in and out of this key area allowing the woofer to handle lots of power while keeping the voice coil cool. This translates to an all around better performing subwoofer. MTX subwoofers are designed to handle a large amount of power and produce maximum bass. With Spider Plateau Venting, cool air is sucked through these large vents, from all angles, directly onto the voice coil as the cone moves forward. As the cone moves backward, it pushes warm air out, forcing it off of the voice coil. By aiming a large amount of cool air directly at the voice coil, we create an extremely efficient and effective self-cooling cycle that ensures the woofer can play longer and perform better than subwoofers employing traditional venting techniques. Traditional venting techniques take on several forms, many of which carry unique titles, but are essentially the same system. Unfortunately, in the end, our analysis shows that they are all less effective than Spider Plateau Venting in achieving their primary objective of cooling the voice coil of a subwoofer. Spider Plateau Venting vs. Pole Piece Venting - This is the most common subwoofer venting system. MTX actually abandoned this method of cooling our subwoofers in favor of the more effective Spider Plateau Venting system. A vented pole piece refers to a hollow pole piece around which the voice coil is suspended. When the cone of the subwoofer moves forward, the excursion draws cool air in. As the cone moves backward, warm air is pushed out. With pole piece venting, there is cool air moving through the inner mechanical workings of the woofer, but it moves through the inside of the pole piece. Therefore, the voice coil is not directly exposed to the burst of cool air. It’s like trying to cool the outside of your car by turning on your air conditioning. Spider Plateau Venting vs. Liquid Cooling - This is similar to using a vented pole piece, but with a twist. In this application, the hollow pole houses an adapter to which a narrow tube can be attached. A liquid cooling agent, such as antifreeze, is then pumped into the tube and held stagnant, thus theoretically cooling the voice coil. Even if we assume the liquid itself is able to stay cool, this method still only cools the inside of the pole piece, not the voice coil directly. Spider Plateau Venting vs. Aero-Vented* Pole Piece - This is a brand name for a vented pole piece. Like any other vented pole piece, the cool air travels up through the inside of the pole piece. The problem is that the voice coil is on the outside of the pole piece! The voice coil is only cooled indirectly. 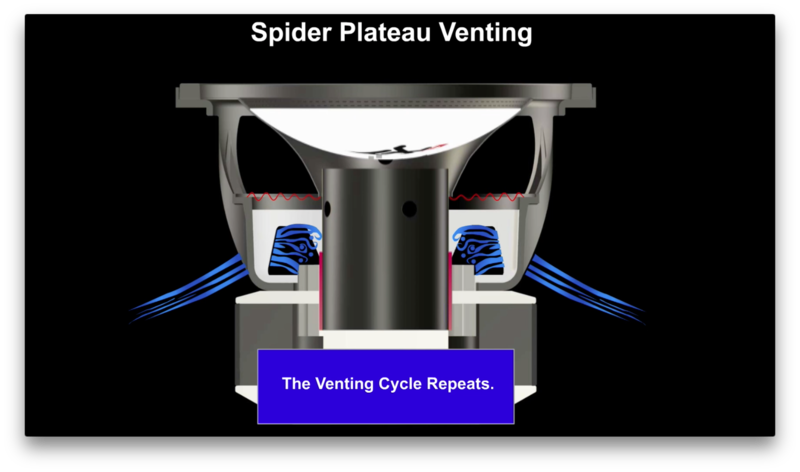 Spider Plateau Venting vs. Combo Venting Systems (Perimeter*, Aeroport*, VRC+*) - Our experience in designing subwoofers has led us to conclude that Perimeter/Aeroport/VRC+ Venting is one of the least effective ways to cool a voice coil. Perimeter/Aeroport/ VRC+ Venting looks great in print because those employing it can honestly say that for many of their woofers, they are using not one, but MULTIPLE venting systems to cool the voice coil: A side vent and either a vented pole piece. Unfortunately, as we all know, two wrongs do not make a right. This system can be equated with a smoker riding in a car. When you open one window, the smoke is directed to that opening and escapes freely. But, when you open all four windows, the smoke just swirls around the inside of the car. In the case of perimeter venting, cool air is brought in, but once inside, it just swirls around getting warmer and warmer until the woofer succumbs and overheats. Spider Plateau Venting can be found on all MTX subwoofer models.